The Italian city can be a hit for all the family. 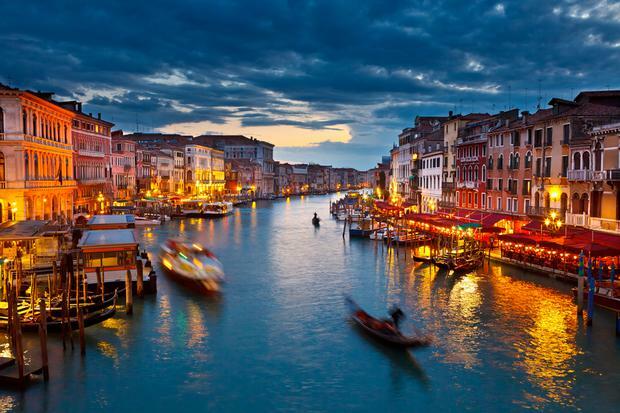 There are few cities as romantic as Venice for a break - but does it have the X Factor for families? I recently took my husband, 10-year-old daughter Nicole and teenage son Mark, to find out. It's only a short flight from Ireland and when arriving in Venice, your taxi or bus will more than likely stop at the city's Piazzale Roma. It can be a bit of a maze if you don't know where you are going as the usual modes of transport are not an option. The Vaporetti (water busses) are fun and easy to use once you've found your bearings. We decided to go for the decadent option of a water taxi to our hotel. It wasn't cheap at €60 as there were four of us, but it could take up to ten passengers, which makes it a reasonable option for a group. The taxis are limited to travel on the main canals only which made the journey longer and an adventure in itself. Sitting under the Italian sky, on plush cream leather seats, we understood why George Clooney chose this city for his wedding! We felt like rock stars on arrival at the Boscolo Venezia hotel. The brightly striped red and white mooring posts mark the entrance of this fine hotel which was once the French Palace. It is housed in the beautiful old mansion Palazzo Rizzo-Patarol in the residential Cannaregio district. When Venice was at the height of its power, this was the only area planted with small crops, which is why Boscolo Venezia is the only luxury hotel in Venice to have a private garden overlooking the lagoon. Our suite was perfect for families and decorated with Oriental carpets and 18th century cabinets: some of the rooms overlook the lush garden but we had a perfect view of the canal to watch the gondolas glide by. Rich in marble, Venetian stucco and chandeliers, it was a cultural experience in itself. The hotel provides a free water taxi to take guests to Piazza San Marco (St Mark's Square) several times a day - it also offers a tour of the Murano glass factories. This made a fascinating excursion for the children who got to see first-hand how the famous glass is blown and shaped. While the usual draw of St Mark's Square is a must for visitors to Venice, after we peeked in to see the awesome interior of St Mark's Basilica and Nicole had her photograph taken on one of the famous lions outside, the kids asked to go back to the quieter district where our hotel was. We battled our way past the crowds at the Rialto Bridge and a sense of calm settled on us in the windier streets. Prices fell considerably in the bars and restaurants the further we travelled from St Mark's. We took time to wander through the Jewish Ghetto which had an interesting range of shops and low budget eateries. Getting lost in Venice is a wonderful way to put in the afternoon, and there is always the attraction of finding new Gelaterias along the way to savour wonderful Italian ice-cream. A water fountain providing free drinking water from a sculpted cast-iron-spout proved a great novelty and was only a few steps away from our hotel. The city promotes drinking tap water rather than using plastic bottles because of waste disposal issues. We only had to stroll a few metres from our hotel to the church of Madonna del Orto which houses an original Tintoretto and allowed me to indulge in a little bit of culture without queuing or expensive entrance charges. A good alternative to churches is the natural history museum and it's only a 20-minute walk from St Mark's. For kids that are agreeable to visiting art galleries the Peggy Guggenheim museum is filled with modern masterpieces that my crew loved. There is a beauty about Venice at night and we felt like cognescenti as we sat in a small trattoria on the Rio Tera Lista di Spagna and ate pasta. We were provided with free wifi - always a big hit with my kids - but watching the locals buy from the colourful fruit and veg stalls was more interesting for the adults. If your kids are still in strollers then Venice may not be a good city break for you, as crowds, steps and bridges can make it difficult to get around. But if you can keep up with your kids, it's a great city to explore with a camera and give them a visual feast for their eyes that will stay with them forever. l Both Ryanair (to nearby Treviso) and Aer Lingus (to Marco Polo Airport) serve the city from Ireland. Check out www.ryanair.ie or www.aerlingus.ie for fares. l For more information on the hotel, see www.boscolohotels.com. Prices start at €182 per night.